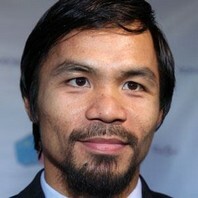 Filipino boxer known by the nickname Pac-Man who became the first eight-division world champion. He received the BWAA Fighter of the Year award in 2006, 2008 and 2009. He was named ESPN's #2 pound-for-pound fighter of the past 25 years in 2016.